If you're searching for a York, PA, lawyer who will give you objective counsel about a legal matter, then call Law Office Of Marc J. Semke. Whether you want answers to specific questions or complete representation, our attorneys in York, PA, are here to help. We handle a wide range of criminal cases, including driving arrests. We can explain all of your rights and options to you. If you're facing serious charges, our team is available to litigate on your behalf. When your best interests and good name are on the line, we're the attorneys to call. We understand that a looming legal situation can be very stressful. This isn't the time for worry or delay. It's time to take action. Our staff always treats York clients with care and respect. So, when we meet with you, our attorney will give personal attention while considering all the facts of your situation. We offer free case evaluations. Schedule a time to meet during our convenient hours. We're also available for evening appointments. You don't have to deal with this alone. 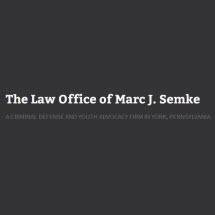 Call Law Office Of Marc J. Semke for counsel and representation from a local York, PA, lawyer. In fact, trying to tackle complicated legal issues alone can hurt you in the end. Please call our team in York, PA, to schedule a consultation. We'll give you the answers you need, and we will help you defend your rights.